"In the quest for life, there is nowhere man will not go." The first full trailer has debuted online for a new documentary film titled Genesis 2.0, which is premiering at the 2018 Sundance Film Festival this month. 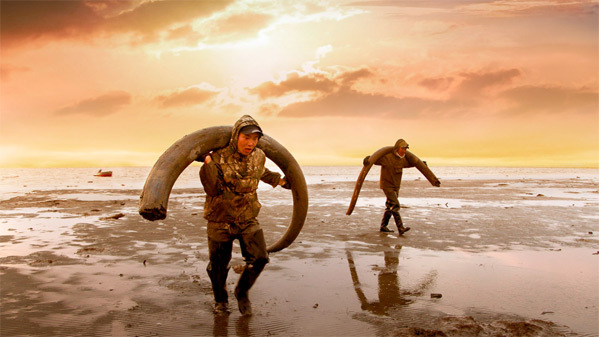 Made by Swiss filmmaker Christian Frei and Russian filmmaker Maxim Arbugaev, the film profiles the "gold rush" happening in Siberia right now - scavengers in the cold who hunt for mammoth tusks (prized in the Chinese art market). Not only do they go into Siberia to understand how these communities of hunters work, but it also goes beyond to explore next step: resurrecting the mammoth is a first manifestation of the next great technological revolution. "Man becomes Creator. Genesis two point zero." That's where the title comes from. This seems like a captivating, mind-expanding documentary that examines "life" itself. Dig in. On the remote New Siberian Islands in the Arctic Ocean, hunters are searching for the tusks of extinct mammoths. There is a gold rush fever in the air. The price for white gold has never been so high. The thawing permafrost not only releases precious ivory. The tusk hunters find a surprisingly well-preserved mammoth carcass. Such finds are magnets for high-tech genetic scientists. They want to bring the extinct woolly mammoth back to life à la "Jurassic Park". Resurrecting the mammoth is a first manifestation of the next great technological revolution. Man becomes Creator. Genesis two point zero. A Film about the secrets and mysteries hidden within nature and the fundamental difference in view of creation and the role of man in it. Genesis 2.0 is co-directed by filmmakers Christian Frei (Swiss documentarian of War Photographer, The Giant Buddhas, Space Tourists, Sleepless in New York) & Maxim Arbugaev. The film will premiere at the 2018 Sundance Film Festival. It's still seeking distribution, so stay tuned for more news.